The World Health Organization has updated their Influenza at the Human-Animal Interface page, which covers novel (mostly avian) flu strains that have infected humans. The cases summarized in today's update have all previously been reported. The chart above shows that - compared to last year's record number of H5N1 avian flu cases - so far, 2016 has been relatively quiet. First up, four recent H5N1 cases in Egypt which are reportedly the first ones detected since the end of last year's record breaking outbreak (see EID Journal: H5N1 In Egypt). Additionally, China reported 1 new H5N6 infection. 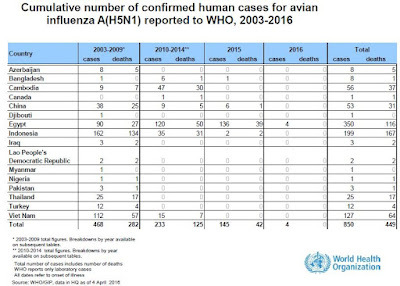 Since 2003, a total of 850 laboratory-confirmed cases of human infection with avian influenza A(H5N1) virus, including 449 deaths, have been reported to WHO from 16 countries (Figure 1). In addition, a total of 11 laboratory-confirmed cases of human infection with avian influenza A(H5N6) virus, including 6 deaths, have been detected in China since 2013. Although other influenza A(H5) viruses have the potential to cause disease in humans, no human cases have been reported so far. According to reports received by the World Organisation for Animal Health (OIE), various influenza A(H5) subtypes, such as influenza A(H5N1), A(H5N2), A(H5N6), A(H5N8) and A(H5N9), continue to be detected in birds in West Africa, Europe and Asia. 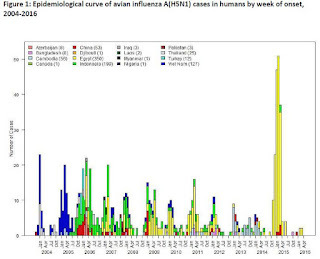 The A(H5N1) virus outbreaks in poultry in West Africa continue since 2014 with increasing reports from Nigeria. No human infections associated with these outbreaks in West Africa have been identified to date. Last month, in Libya's Under Reported Burden Of H5N1 (FAO Workshop) the FAO stated that HPAI H5 had ` caused death of at least four people since December 2014'. Those apparently have not been WHO confirmed, as their latest chart (below) still doesn't show Libya as an H5 affected country. Today's report also summarizes the 29 H7N9 cases reported by China, and 1 case by Hong Kong, over the past month. Since the last update, China reported 29 new laboratory-confirmed human cases of avian influenza A(H7N9) virus infection to WHO (Table 2). Onset dates range from 17 January to 19 February. Cases range in age from 21 to 78 years, with a median age of 57 years. Of these 29 cases, 22 (76%) are male. The majority (24 cases, 83%) reported exposure to live poultry, slaughtered poultry, or live poultry markets; the other five cases had no known exposure history. Cases were reported from 6 provinces and municipalities: Zhejiang (7), Hunan (7), Jiangsu (6), Guangdong (4), Fujian (3) and Shanghai (2). Among these 29 cases, three clusters of two human cases each were reported. For more details on these clusters, see the Disease Outbreak News. 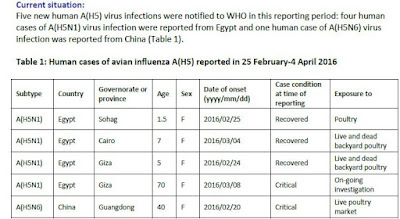 Additionally, one laboratory-confirmed case of avian influenza A(H7N9) virus infection was reported to WHO from Hong Kong Special Administrative Region (SAR) (Table 2). The patient is an 81-year-old woman with underlying illnesses, who travelled to Kaiping, Guangdong Province on 5 March. She developed malaise, headache, shortness of breath and fever on 10 March and, between 14 and 16 March, was admitted to a hospital in Kaiping. Upon returning to Hong Kong on 17 March, the patient visited a hospital and was subsequently admitted for management of pneumonia. She tested positive for avian influenza A(H7N9) virus upon laboratory testing by the Public Health Laboratory Services Branch of the Centre for Health Protection (CHP). The patient was transferred to a different hospital for further management. Currently, she is in stable condition. Initial investigations by the CHP revealed that the patient visited a live poultry market in Kaiping during her stay in Mainland China, where she was exposed to slaughtered poultry. A total of 752 laboratory-confirmed cases of human infection with avian influenza A(H7N9) viruses, including at least 295 deaths3, have been reported to WHO (Figure 2, Table 2). 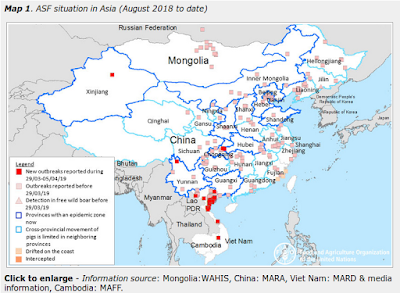 According to reports received by the Food and Agriculture Organization (FAO) on surveillance activities for avian influenza A(H7N9) viruses in China4, positives among virological samples continue to be detected mainly from live bird markets, vendors and some commercial or breeding farms.